WILMINGTON, Del. (April 9, 2019) – Winston-Salem turned its first triple play in the Dash era (2009-present) on Tuesday night against Wilmington, but the Dash fell 2-1 in 10 innings against the Blue Rocks in the middle match of a three-game set at Frawley Stadium. For the fifth consecutive contest, the Dash plated the game’s first run. In the fourth, Craig Dedelow, who has now reached base in all six games this season, stroked a single to right with one out against Wilmington right-hander Nolan Watson. Yeyson Yrizarri followed by bouncing a groundball to Blue Rocks third baseman Angelo Castellano. On the play, Castellano threw wide of second, allowing Yrizarri to reach base and Dedelow to scoot to the third. Then, with Carlos Perez batting, Yrizarri stole second, and Blue Rocks catcher Sebastian Rivero’s throw to second sailed into center field, allowing Dedelow to score. Codi Heuer relieved Castillo and recorded two perfect innings, while Alec Hansen tossed a hitless bottom of the eighth. Kincanon followed with a scoreless frame in the ninth before the Blue Rocks pulled out the victory in the next frame. Holden Capps (1-0) recorded two scoreless innings to earn the win for Wilmington. The Dash kick off their 10th anniversary season at BB&T Ballpark on Thursday against the Potomac Nationals. Thursday’s home opener will be a Thirsty Thursday, presented by Lowes Foods, and a Pups in the Park outing, presented by Handy and Handy Orthodontics. Following Friday’s game, there will be a postgame fireworks display, presented by PTI. A Food Truck Festival and a Chick-fil-A Four Pack Night are on deck for Saturday, while a Rayados Day (presented by Univision) and a Craft Fair are on tap for Sunday. 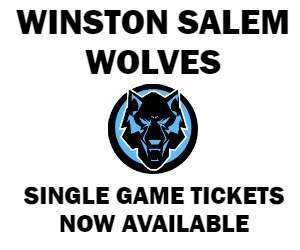 For tickets and more information, call the Dash at (336) 714-2287 or visit wsdash.com.